So far, smartphones with HD displays have really struggled to get good grades in our test – the LG Nitro HD is the worst performer so far and the HTC Rezound is just above it in the leaderboard. The Samsung Galaxy Note did manage to put in a pretty good performance despite its HD screen, but that one had a huge 2500 mAh battery. The Samsung Galaxy Nexus on the other hand has a slightly smaller, 4.65″, Super AMOLED, but notably less powerful 1750 mAh battery. That’s certainly one of the worst screen-size-to-capacity ratios we have seen, so we started the test knowing that anything but last place will be a success for the Nexus. 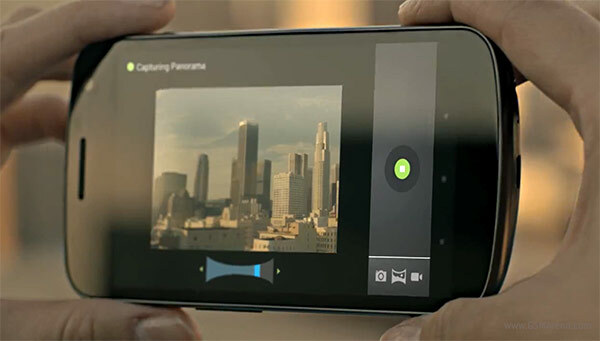 Telephony is how it all started and that was the Samsung Galaxy Nexus one chance to get a decent score. With the screen turned off for the duration of the calls, the Nexus had the chance to make its larger-than-usual battery count and that’s exactly what it did. A fully charged Galaxy Nexus took 8 hours and 23 minutes of 3G talking to switch off. That’s exactly what the manufacturer promises and it was enough to secure the ICS pioneer a good mid-table position. The second test was web browsing and the Samsung Galaxy Nexus was in for a rough ride. For comparison’s sake, despite its huge battery, the Galaxy Note phoneblet only managed 3:35 minutes of browsing, using a screen of the same technology. The predominantly white webpages are really taxing on AMOLEDs and the Galaxy Nexus paid the price here. It only endured a minute over 3 hours of our automated script before it switched off and placed last of all tested smartphones. And it was some way of the pace, as you can see from the table. The video playback test concluded the round of individual tests and the good news is that the Galaxy Nexus did fairly well in it. It wasn’t great, but after the web browsing fiasco, the 6 hours and 2 minutes seemed like good news. Needless to say that after such results, we were having no illusions about the Galaxy Nexus real life endurance. 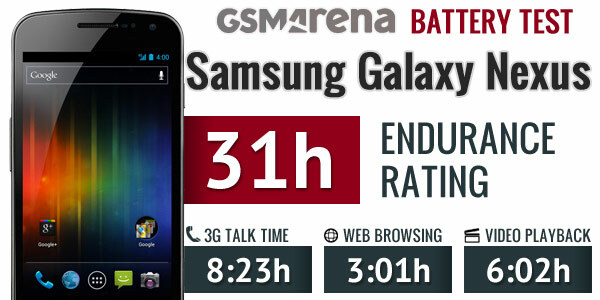 The smartphone’s standby wasn’t particularly efficient either and it got a total endurance rating of 31h. This suggests that you’ll need to charge the Samsung Galaxy Nexus every 31 hours if you use it for an hour of 3G telephony, SD video playback and web browsing each day. That’s tied second worst score we have seen so far, but as we told you, it wasn’t completely unexpected. On a positive note, the Galaxy Nexus matches the HTC Rezound and outdoes the LG Nitro HD and they have screens smaller by 17% and 7%, respectively.